U.S. National Parks could become even more important for the conservation of bird species in the face of climate change, according to a study published March 21, 2018 in the open-access journal PLOS ONE by Joanna Wu from the National Audubon Society, US, and colleagues. The U.S. National Parks offer strong protection for birds from many invasive and ecological threats, but little is known about the impact of climate change on bird populations living in the national parks. Wu and colleagues related species distribution models from the North American Breeding Bird Survey (summer) and Audubon Christmas Bird Count (winter) observations to climate data from the early 2000s and projected to 2041-2070. The researchers analyzed climate suitability projections over time for 513 species across 274 national parks, under a high and low greenhouse gas emission scenario. They then classified climate suitability for birds as improving, worsening, stable, potential colonization, and potential extirpation. 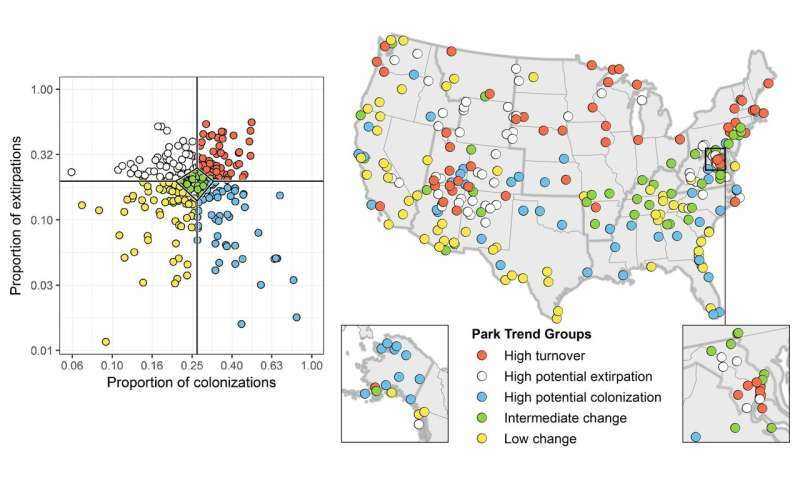 The researchers found that potential colonization of species in U.S. National Parks exceeds potential extirpation in more than 60% of parks, and if projected extirpations and colonizations were realized, the average park would have 29% more species in winter and 6% more species in summer. The authors suggest that their findings reinforce the importance of the U.S. National Parks to the conservation of birds in the face of climate change and the value of monitoring species distribution to better inform conservation and management strategies. "Over the next few decades, the majority of birds currently found across the National Park System are expected to experience changes in climate conditions, which on average may lead to turnover of nearly a quarter of the bird community per park," says Gregor Schuurman, co-author on the study. "Despite these changes, parks will become increasingly important as refuges for birds in the future."